It is probable that people have been riding wives as long as humans have been swimming in the ocean, but while lying down – this practice can be referred to as “bodysurfing”. Surfing while standing upright, however, was likely practiced and perfected by the polynesian people of Hawaii before the island chain was known to exist. Hawaii was first discovered by Europeans in 1778 by Captain James Cook and the crew of his two ships when they landed there on a stopover from Tahiti to North America. They took off again, looking for a Northwest passage between the Atlantic and Pacific Oceans that they would never find. They returned a year later on their way back, and Cook was killed by the Hawaiians when negotiations for the return of a stolen boat went sour. During that time, Lieutenant James King of the Discovery journaled about one of the Hawaiians’ pastimes, which is the earliest account we have of surfing. At this point, surfing was already well established in the Hawaiian culture, and it was a very big deal. Art, sport, and religion – it was called the “sport of kings”, and the chiefs showed off by being great surfers on incredibly heavy boards that ranged in size up to 24 feet long. The royalty got preference in beaches, reefs, and boards, but almost everyone was involved in surfing to some extent. Good surfers got a great deal of respect, and the older experts were known as “kahunas”. Surfing figured heavily in every aspect of Hawaiian life, including stories, songs, and chants. Unfortunately, when Cook’s ships returned to Europe (albeit without Cook) with news of the island chain’s existence, all manner of mariners from missionaries to pirates made Hawaii their pit stop of choice, fouling the formerly pristine culture with their ways and brought about a long decline in surfing; the missionaries are chiefly to blame for this, since they usurped and stripped the Hawaiians’ religion and culture down to suit the Christian ideals they had brought with them and forced upon the Hawaiians, and surfing had been part and parcel of said religion and culture. The Calvinist missionaries essentially taught the Hawaiians that exercise and sports were against the laws of God, but those who defended their position claimed that by doing so the missionaries improved the Hawaiians’ way of life. Not to mention that between disease and alcoholism brought by the Europeans, the Hawaiian population was reduced by up to 90% by the end of the 19th century. Surfing didn’t disappear, but became a rare sport on the islands. Where before hundreds of people would be surfing the reefs, now only a few – sometimes just one – would be seen riding the waves. It wasn’t until celebrated author Jack London (Call of the Wild ) visited the islands and experienced surfing that surfing was revived; he wrote a story that was published in a popular magazine, and in 1907 one of the men who was surfing with him, George Freeth, was invited to demonstrate surfing in southern California. The next year another guy who surfed with London, Alexander Hume Ford, managed to set up the first surf club in Hawaii dedicated to preserving the sport of surfing. A Hawaiian olympic swimmer named Duke Kahanamoku worked to popularize surfing in Hollywood in the early 1900’s, and introduced Australia to the sport; Australia is now considered to be one of the biggest hubs of surf culture in the world. Surfing then began to slowly revive, until it boomed in the late 1950’s and into the 60’s. It emerged worldwide with the release of the movie Gidget, which was based on a real-life surfer girl of the same name, and soon surf movies, music and culture became all the rage. Surfing is now practiced on coastlines all over the world, and can be discovered through countless magazines, websites, and videos. 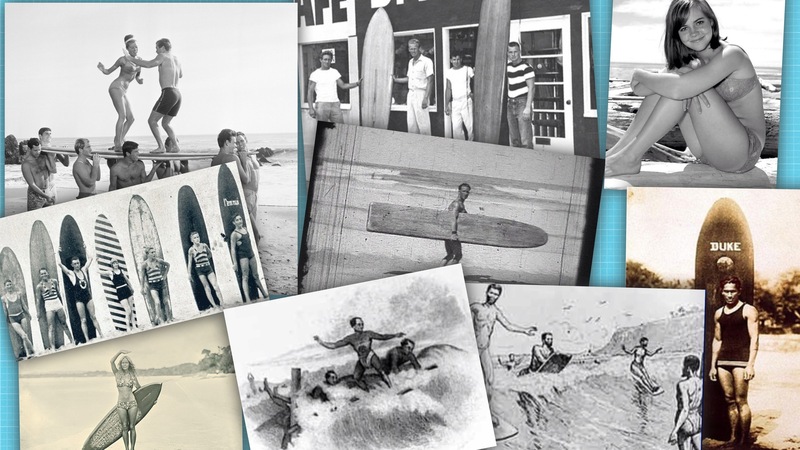 See pictures and more on the history of surf at our Pinterest page!